The guidance of an Everton legend almost 20 years ago has helped Leyton Orient to their best-ever start to a season. Russell Slade has led the O's to wins in their opening five games, which has put the club two points clear at the top of League One. Slade was given his first taste of management at Notts County in 1994 and worked alongside former Toffees boss Howard Kendall. "When I first had the opportunity at Notts County I was 34 and I think I was the youngest manager in the Football League at that time," Slade told BBC London 94.9. "You think you know everything and actually you know very little. "I learnt a lot off Howard Kendall when I was there. "Certainly in terms of man-management, which I think is four-fifths of the job." 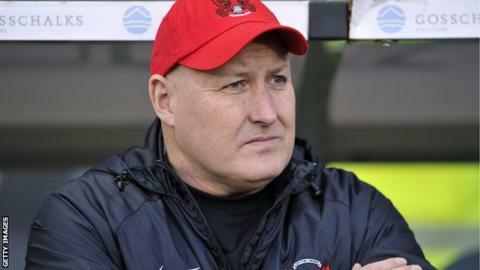 Slade, who was appointed Orient manager in April 2010, has had to cope with a small squad during his tenure at Brisbane Road. O's striker Kevin Lisbie has described the 52-year-old as his "perfect manager" for the way he handles older players. "At Premier League and Championship level they have their own challenges but a big base of players," added Slade. "They can swap one international for another. I can't do that here. "It is important we get the very best out of the players you have here. "To do that you need to do different things and we have to deal with that." Orient chairman Barry Hearn describes Slade as "an inspirational" manager and credits his current success to his man-management skills. "I can't speak highly enough of him," said Hearn. "He has built a team spirit the like of which I have not seen at this football club in my tenure as chairman. "I hung in the back of the dressing room at the end of the Colchester game while he was talking to the lads. "I've done a few pep talks to fighters, snooker players and darts players but that was inspirational and Shanklyism at its best. "The hairs on the back of my neck went up and I began to understand how he has put together this team spirit. "It is a very tight-knit group and you need to have that togetherness when you have such a small squad," Orient captain Nathan Clarke told BBC London 94.9. "This start has put us well in the driving seat. We have got to keep pushing ourselves and believe we can keep this run going. "If we want to get promoted at the end of the season we have got to be positive. "The confidence throughout the team is fantastic at the moment." "You could cut the atmosphere in the dressing room with a knife but the feeling was a beautiful moment in sport." Slade credits continuity and momentum for Orient's start to the new season; they have carried on their form from the end of last season, when they won six of their last 10 matches and missed out on the play-offs by three points. "The nucleus of the squad remained together and I think that was a massive plus," he said. "There are no energy-sappers in the changing room - they are all positive. "We have got the changing room exactly where we want it and I think that counts for an awful lot as they will do that little bit more for each other. "We haven't made too many changes from last year, with the same goalkeeper, roughly the same back four, the same two wide players in Moses Odubajo and Dean Cox and the same two front men in David Mooney and Kevin Lisbie. "We have had a better start than we anticipated. "We are enjoying it and that is an important part of it. We are not putting pressure on each other." Former Scarborough, Grimsby, Yeovil and Brighton boss Slade has twice led the east London club to seventh place in League One. However they have been notoriously slow starters under Slade - winning one of their first seven league games in 2010-11, failing to win any of their first 10 in 2011-12, and losing their first three games last season. "In the changing room there is a quiet, unassuming belief that we could do something this season," he said. "If that is a top-six finish, then that is what we set out to do at the start of the season. "We have brought a little bit more science and performance analysis to the club, which all helps give you a bit more of an edge. "We are all buying into that and making sure we do things right." Slade is now the fifth-longest serving manager in the Football League, and sixth in the top five divisions of English football if you include Arsenal's Arsene Wenger in the Premier League, and he signed a new three-year deal with the Brisbane Road club this summer. He says stability has helped him move the club forward. "Most people like stability and they don't like change," he said. "Changing every six, nine or 12 months doesn't encourage development or success. "To have that bond and that respect over a longer period of time is important. "I always go home and ask myself 'have I moved the club forward or improved anything over the last day, week or month?'. "You have to ask yourself that question if you want to get better." With Wolves still receiving parachute payments from the Premier League, Peterborough targeting an immediate return to the Championship and the likes of Brentford, MK Dons, Preston and Rotherham likely to be in the promotion mix, Orient face a battle to still be in the picture come May. "Can we keep it going another one, two or three weeks?" said Slade. "People don't expect us to be up there for forever and a day. We will do everything we can." Hearn added: "We will not get carried away but we are top of the league. "Can we stay there all season? Well, why not? Let's give it a go." Interviews with Russell Slade and Nathan Clarke by BBC London 94.9's Phil Parry. The BBC Sport website will have a feature on football below the Premier League every week as part of our Football League Friday series.